This week we have been learning about the importance of working together. Our discussions around this have tied in well with the development of our essential agreement and class job descriptions. 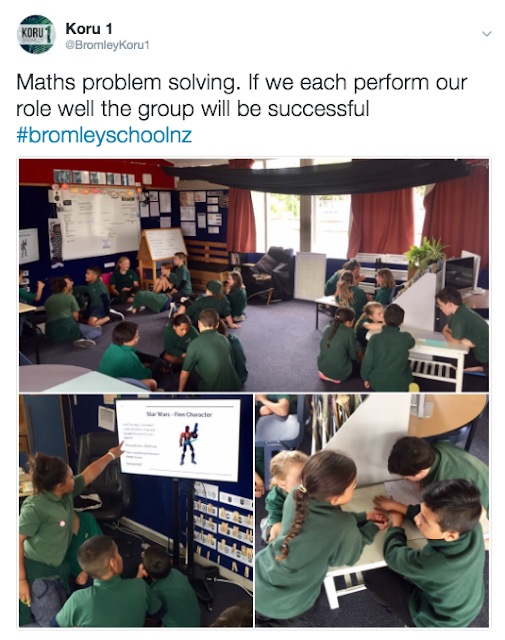 One way we have been exploring participating and contributing has been through taking on team roles for maths problem solving. These roles have included team leaders, resource managers, recorders and reporters. The more sessions we have done, the better we are becoming at accepting roles, having a positive input and actively encouraging others. Many of the problems we have been working on have multiple solutions and require the members of each group to understand the group's answer/s and be able to articulate their solutions to the larger group. It has been a challenge, but we know that a culture of collaboration, communication and growing strong relationships is important in Koru 1.
its good to see koru1 working hard.